The stars at night are big and bright, deep in the heart of the Texas Station! Luckily, your wallet doesn't have to be! These popular cheap Vegas hotels Off-Strip would be the plastic surgeon's daughter if this were high school. 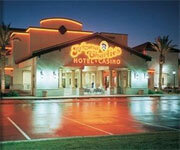 Arizona Charlie's Decatur: This might not be the best of the cheap Off-Strip hotels Las Vegas to stay at if you're not an avid smoker. We're not recommending that you bring the kids here for a week, unless they are already smokers, then they might enjoy it. If you're a smoker, nobody is going to complain about you taking plenty of puffs on vacation though. Other than that, there are plenty of cheap eats here, like a $6.99 Sunday Brunch buffet. Yeah, we can get up on that. 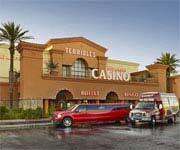 So if you want a cheap place to eat and can't get over the smokiness, this is one of the best cheap Hotels Off-Strip Vegas for you. 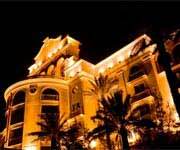 Orleans Hotel and Casino: This is one of the more family friendly cheap Off-Strip hotels Las Vegas. 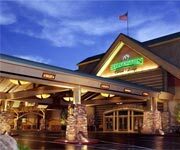 The hotel and casino are overall less smokey and the high ceilings in the casino provide a freer and more comfortable atmosphere. 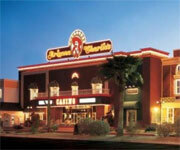 The kids can enjoy the movie theatre, bowling alley, and multitude of restaurants. They are in a remote and quiet location off the Strip, but still have quick and easy access to the Strip and I-15. This is about as far off as cheap Off-Strip hotels Las Vegas come. It's good if not being on the Strip is what you want. Staying on the Boulder Highway is like staying in the suburbs, but you're still close to Vegas. Some people like that. Boulder Station Hotel and Casino: The rooms here are pretty standard, nothing special, but for the most part this place is clean and neat, like a little hotel in the suburbs. This is definitely not your typical Vegas hotel, but if you're looking to stay at one of the cheap Vegas hotels Off-Strip, maybe you're not looking for full-blown Vegas hotel anyways. 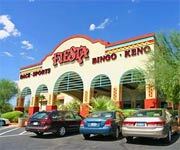 They've got a 600-seat bingo room, so if you didn't get enough bingo playing back home every week, you'll be able to play with 599 people in Vegas. How do those odds sound? Pretty good after you hear that the room never actually fills up. 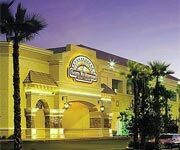 Eastside Cannery Casino Hotel: These are some of the nicest room in the cheap off-Strip hotels Las Vegas. And by the nicest we mean they are not overly tacky, because they also have absolutely nothing memorable going on as far as decorations or notable stains and needed repairs go. The rooms seem to always be clean and most of them have great views. You're not going to get views of the Strip, obviously, but if you're staying Off-Strip, you probably don't want those anyways. The casino and restaurants are is pretty decent as well. Nothing special, but nothing to complain about. Which is a statement that easily defines the whole hotel. Cheap Las Vegas hotels Off-Strip aren't known for their beautiful pools and fabulous parties. These hotels get you from one day to the next, and hopefully you're drinking heavily enough not to notice that the sheets didn't get washed after the room was last used 2 weeks ago. Just kidding, people come more often that. If you're still frigid about spending money on a hotel, there are tons of Las Vegas deals that will make up the money you're spending on a room and save you big on all your other activities. Cheap Vegas hotels Off-Strip are really more popular with the locals who are in it for the gambling. If you're in Vegas for some gambling, it wouldn't be a totally bad idea to get out here for a game of cards. The buy ins are usually lower and the people are generally far nicer. Most of the people that live in Vegas moved out here specifically because they like to gamble though, so while this might be vacation to you, this is just another Thursday night to them. 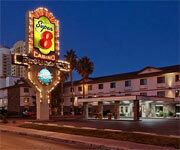 Cheap Off-Strip hotels Las Vegas provide the benefit of staying in a much less crowded venue. 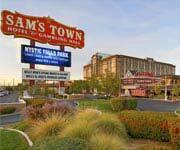 There are plenty of other things to do in Las Vegas than sit in a casino all day, and if you are going to do that all day, you might as well stay in one of the cheap off-Strip hotels Las Vegas because you won't need the convenience of walking down the Strip to anywhere anyways. It won't even matter. 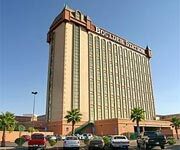 If you're actually looking for cheap hotels Off-Strip Vegas for sleeping purposes, there are some places with some good beds, good pools and you'll get them for a lot cheaper than you can sleeping on the Strip. 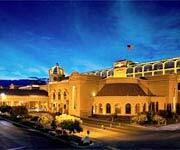 In fact, there are Las Vegas coupons that will get many of these rooms even cheaper than they already are. Let's face it, most people don't spend that much time in their hotel rooms anyways in Vegas, so why bother over-paying. You're going to need that money for gambling. Or possibly for gambling rehab.